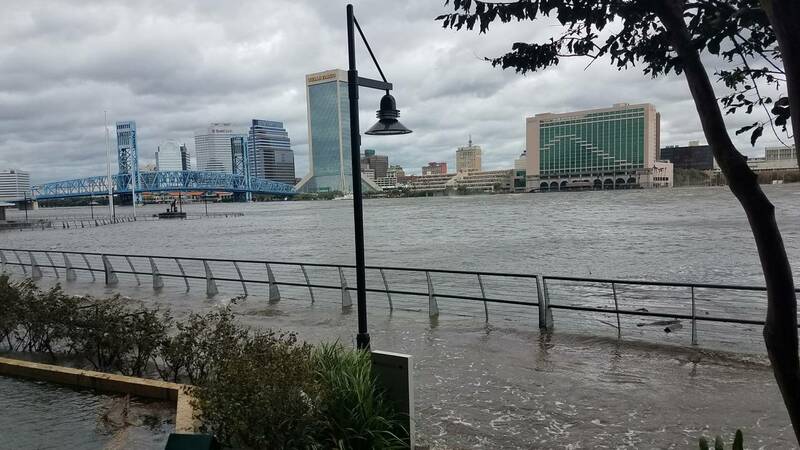 JACKSONVILLE, Fla. - As hurricane season begins, a local group is concerned about what future storms could mean for Jacksonville and the role the St. Johns River will play. The St. Johns Riverkeeper held a demonstration Friday on the Southbank to discuss how future dredging projects and sea level rise could making flooding worse in Jacksonville. The Riverkeeper said last year’s historic flooding from Hurricane Irma could be just the beginning. "I've lived in the north Jacksonville area my whole life and I've never experienced anything like Irma, said Dot Mathias, president of the North Jacksonville Civic Association. Mathias took part in the demonstration, voicing her opposition to future dredging on the St. Johns River. The project is set to make the channel 7 feet deeper. “Once our estuaries are gone, once the salinity comes into our river, then we’re going to lose our dolphins, our manatees and our estuaries," Mathias said. Sea level rise was also a topic of conversation. The Riverkeeper said dredging, rising water levels and tropical weather could create a perfect storm. That's why the group wants to hear from the public. The Riverkeeper will be hosting a series of town hall meetings around the city this summer. The town hall meetings are free and open to the public. Experts will be present to answer questions about the environmental issues. Thursday, June 21 at 6:30 p.m.
Thursday, June 28 at 6:30 p.m.
Friday, June 29 from noon to 1 p.m.
Wednesday, July 11 at 6 p.m. Updates on the town hall meetings will be posted on www.stjohnsriverkeeper.org.